WooCommerce is an excellent e-commerce platform that works seamlessly with WordPress. It is fairly easy to set up and has lots of extensions that are built specifically to integrate with it. WooCommerce itself is free soft ware (you can choose to pay for a support package if you need), but most of the extensions have a cost involved with them. In the case of Riffe Lake campground, we only needed to purchase the Authorize.net extension to interface with the payment gateway. We chose to use the SIM version, which takes the customers to an Authorize.net payment page rather than collecting payment information directly on the website to avoid much of the complications of PCI compliance that is required by the credit card processing companies. 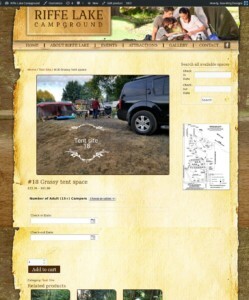 To manage the campground bookings I installed the premium Booking & Appointment plugin. The basic package did not cover all of the requirements for the site, so we also purchased two extensions for this plugin. The first one allows us to set seasonal rates and the second one gave us the ability to add a service fee to each reservation. What makes this system work so well is that it uses WooCommerce’s product system to manage all of the rental units. Each unit becomes a product and can then use the product variation feature of WooCommerce to add options to each unit individually. For now, that means that each space can charge and extra amount depending on the number of visitors. In the future there could be other variables added to add value to the rentals. 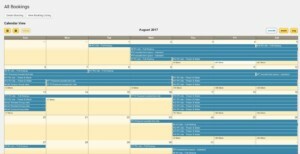 One issue that I had with the Bookings & Appointments plugin is with the search function. The search works perfectly to display units that are available within the days selected, but there is no current way to narrow the search to only one category such as RV site or tent sites. This will require customization and we will come back to it at a later date when we further upgrade the website. On a positive note, the Tyche Software support is very good. They take extra effort to answer every request and help solve confusions or issues that come up. 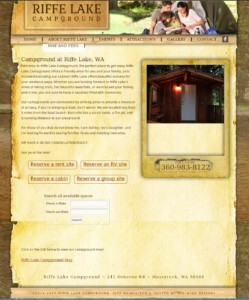 Take a peek at RiffeLakeCampgroundWA.com and see how it works. Please feel free to offer any feedback in the comment section below. Sea-Wing Designs provides Website, Graphic Design and hosting services to businesses and non-profit organizations.